Bed bug treatments can get pretty expensive. It’s common for professional treatments to cost over $500 per room. Even do-it-yourself methods, such as our 4-step solution, start at a couple hundred dollars and go up from their depending on a number of factors. When a sudden expense like this pops up, it’s natural to want to cut corners to save money. Some people have tried skipping the bed bug encasement portion of the treatment process, and they don’t realize what that shortcut might cost them. If you don’t know what a bed bug encasement is, here is a quick overview: the encasements we offer are zippered covers that enclose your mattress or box spring in a sealed, bed bug proof enclosure. These SafeRest encasements in particular have patented micro zippers with 360° Secure velcro seals. They’ve been scientifically proven through independent testing to keep bed bugs out of your mattress, and to stop bed bugs already on the mattress from escaping or feeding. If you keep the encasements on for at least a year, any bed bugs inside will die of starvation. There’s a common misconception that a bed bug encasement is somehow supposed to prevent bed bugs from reaching you in your bed, or that it somehow kills bed bugs that get onto the bed. This is a clear misunderstanding of how an encasement works and what it’s supposed to do. First off, there is nothing insecticidal about an encasement. It’s a hypoallergenic fabric product with a waterproof back coating. There’s nothing here that kills bed bugs, and it isn’t intended to stop bed bugs from getting onto the surface of the bed. Think of it like a raincoat: a raincoat’s job is to stop rain on the surface, and not to let it get underneath and soak the wearer. Naturally, a raincoat can still get wet and it’s still doing its job if that happens. What a bed bug encasement does is eliminate a ton of potential hiding places for bed bugs. All of those seams and tufts and folds on your mattress, and all of the wooden joints and corners on your box spring, are places that bed bugs would like to tuck away in between meals. When they’re hidden from sight, they’re safe to rest, digest, and reproduce. Encasements cover all of those hiding places and replace them with a single, smooth surface that bed bugs can’t penetrate. This will make it a lot harder for bed bugs to hide in your bed, and a lot easier for you to spot any signs of bed bugs thanks to that solid white surface. What this means for your bed bug treatment is that you only need to treat your mattress and box spring once. After you’ve gone over those hiding places with a vacuum, steamer, and sprays, you can put the encasements on the mattress and box spring and forget about them. You’ll need to perform follow-up treatments a couple of weeks apart to hit any survivors or new hatchlings, but you won’t need to retreat the mattress and box spring. The encasements have ensured that there won’t be any bed bugs inside that can feed or breed. If you do find bed bugs on the surface of your encasement, treating them will be very easy. Simply remove the encasement from the bed and throw it in your washing machine with the rest of your bedding. SafeRest encasements are machine washable with a non-bleach detergent and can be tumble dried on low heat (as recommended by the included care instructions). This laundry cycle will kill any bed bugs or eggs on the encasement. That’s much easier than inspecting and treating your mattress or box spring all over again. Not only are SafeRest encasements indispensable for bed bug protection, they offer other bed protection features for your day-to-day life. The cotton terry sleeping surface is breathable and naturally absorbent, and the waterproof membrane layer underneath blocks fluid spills, dust mites, bacteria, and seasonal allergens from reaching the mattress. These protective features make mattress encasements a must-have for anyone with kids, pets, allergies, asthma, or incontinence. It’s no wonder that they’ve been a top seller of ours year after year. If you’re dealing with a bed bug infestation, do yourself a favor and avoid cutting corners. We recommend the products and treatment methods that we do for good reason, based on the years of experience we have helping people get rid of bed bugs. A bed bug encasement, like any other product we carry, is not an all-in-one solution. However, it’s just as essential a tool as any other in the bed bug toolbox. At the end of the day, investing in the right products and treatment methods the first time will save you money in the long run. Protect your mattress against invading bed bugs, dust mites, fluid spills, and more. 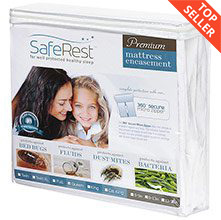 SafeRest mattress encasements were designed from the ground up to provide premium bed bug protection and allergy relief.